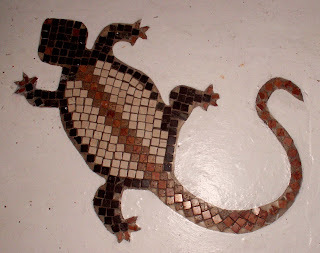 When we moved to our current house, we liked to do something special and original to our bathroom, so I designed a mosaic of a lizard for the bathroom floor. It’s made of very little tiles of natural stone. 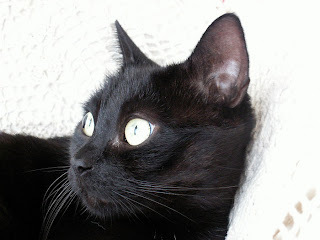 I would give back all the before mentioned Wanted Items and all other stuff I ever wanted for just this one: my sweet cat. I lost my very dear little friend and am inconsolable and totally heartbroken. This bag I made yesterday in just one evening (great thing to make if you don't like long term project, like me) with a crochet hook size 10 (European size) and a ribbon thing called Zpaggeti. The rose is bought and not made by myself. The handles I bought here. 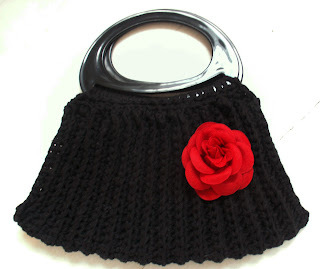 The bag is lined on the inside, so small things can't escape through the little holes formed by the crocheting. WANTED I want this dress! And can I have the hair, too? 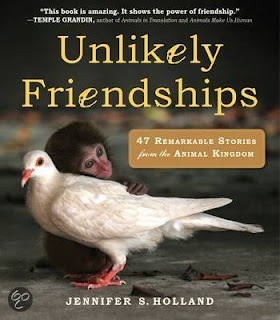 It’s an adorable book about friendship and love between different animals, with a lot of pictures. One of the friendships is between a (very big) rat and a cat; that one I like the most. Another one I like is the friendship between a Siberian Husky and a polar bear. The most touching picture in the book is one of a macaque who’s carrying a cat in his paws, as carefully as any mother would carry her baby. So sweet! This book is really perfect as a gift for Valentine’s Day. I found this 'woven heart' at the Paper Matrix, but found it quite difficult to make. My heart didn't exactly end up the same as the one I found at the Paper Matrix, but I like it anyway. Some weeks ago I started to crochet a blanket. Waves in four colors. 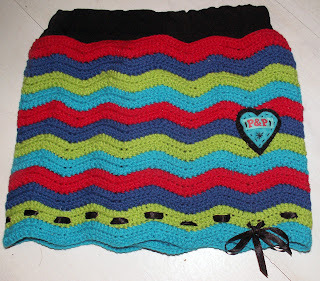 After four rows of crochet I knew this wasn’t for me, being not the one for long term projects, so I decided to change from Very Large Blanket to Small Skirt for my youngest daughter (she’s 2 years old). I’m quite happy with the result. What do you think? WANTED Oh, how I love this bag! 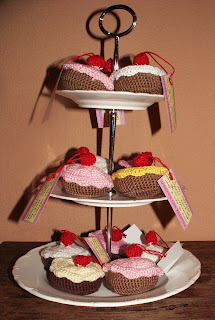 Those cupcakes I made a couple of months ago, as a 'Bye Bye Gift' for the kids when my oldest daughter said goodbye to kindergarten and went to elementary school. WANTED Don't you love this dress? The most favorite dish in our home is chicken with Cajun seasoning and garlic sauce. We call it ‘Chicken Shoarma’, but that’s just because of the pita rolls (although you can take shoarma seasoning instead of Cajun seasoning to make it real chicken shoarma, of course). Cut the chicken breasts in little pieces and sprinkle with Cajun seasoning. Cook in some oil until golden brown. Meanwhile stir parsley, mayonnaise, garlic and yoghurt until you have a smooth sauce. Make four portions and spoon each portion in a pita roll. Pour sauce over it. Serve with salad and fries. Enjoy!